Many businesses begin with a unique or innovative product. It?s a solid foundation for any company; however, that?s not enough for continued success. Competitors eventually catch up, so the best companies are often those who continue to innovate, continue to improve their offerings. At Maxwell Products, our laboratory works every day to continually improve our pavement preservation products..
?Maxwell Products provides me the opportunity to apply the expertise, knowledge, and abilities I have acquired and make contributions to the industry,? said Weijie Ren, PhD, polymer engineer. ?I love the fact that one day I could be out on the road helping clients with their problems whereas the next day I can be in my office working with a team of talented people trying to solve a complex technical problem.? ?As a polymer chemist with over seven years of hands-on experience in polymer compounding and processing, I am able to apply my knowledge of formulation designs, functional modifiers, additives, etc. in the research and development of crack sealants. Meanwhile, I stay up to date with cutting-edge technology by reviewing the literature of the field and applying it in the product development after proper assessment of the information.? Maxwell Products? dedication to innovation has produced such breakthroughs as the industry?s first (and still the best) fully meltable, patented packaging solution known as PolySkin. It also produced design innovations like Maxwell?s exclusive, easy-opening ZipBox cardboard packaging, as well as numerous, industry changing formulations for crack sealant, GAP Mastic, and GAP Patch void and pothole repair solution. ?Our goal is to meet customers? needs,? said CEO, Ken Maxwell. ?Innovation is really just the result of trying to solve customer problems.? ?By having the right ingredients and their combinations, the long-term performance of our products in general will be further improved to better serve the purpose of pavement maintenance and preservation,? Ren added. Polymers aren?t new to crack sealant or material binders, as the term ?polymer-modified? has been around for a while. But that isn?t where Maxwell Products stops, at ?good enough? or ?me too.? Maxwell Products continues to test new or different polymers to develop pavement maintenance materials with advanced properties. One such property is UV radiation protection. In some hotter climates, the conditions can be so extreme the sun literally bakes crack sealants, adversely affecting the material?s adhesion and flexibility. Maxwell Products is developing new products for these hot, dry, arid climates to better protect the pavement maintenance materials and help them last longer and perform better. ?Right now, we have new ingredients that Weijie has brought in to help with that issue,? said Mike Guymon, materials engineer. ?Already, we?ve seen some interesting things. It?s an exciting time for us.? And while chemistry is eminently important, so is geology. Yes, you read that correctly, geology. For products like GAP Mastic and GAP Patch, the proper, engineered aggregate is crucial. One cannot simply use any old, native rock, as some aggregate is too soft, some fractures or polishes too easily, some is vulnerable to chemical breakdown. 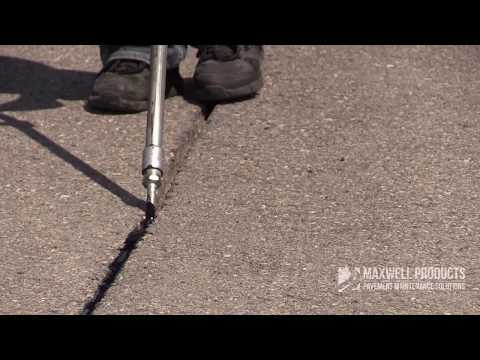 But Maxwell Products has identified the Goldilocks aggregate that is just right for pavement repair applications, ensuring necessary stability, durability, and load-bearing capacity. A recent study by Arizona State University asserted that load-bearing capacity is affected by the Degree of Interlock (DOI) among the aggregate within the binder, meaning that the higher degree to which the aggregate interconnects like building blocks, the greater strength and impact resistance the resulting material will possess. Aggregate polishing, on the other hand, is a natural occurrence of repetitive traffic load. Maxwell Products? engineers and laboratory personnel continue to evaluate various mineral samples to find additional properties that can improve even high-performance products like GAP Mastic and GAP Patch, increasing DOI (hence stability and impact resistance) and resisting polishing (hence a better friction surface). ?Degree of Interlock is affected by so many things about the rock, the shape, the size, the cleanliness, resistance to impact, soundness,? Guymon said. ?It?s amazing how much the aggregate affects those things.? Newer and better is the mantra of Maxwell?s research laboratory. Other avenues for development at Maxwell Products include alternative ways to put polymers in solution, innovations to help customers with cleanup, and products designed for specialized locations, cul de sacs for example. ?Research and development is really one of our core products,? Maxwell said. ?We invest heavily in our laboratory because our business is working with customers to solve problems. Collaboration with customers, sales, and the lab has led to our best products.? When selecting products for your pavement maintenance needs, choosing a manufacturer which produces materials adequate to meet specifications is fine. But choosing a manufacturer which produces high-quality products and continues to improve its materials will benefit your projects both in the short and the long term. ?We know that no matter how good a product or solution is, it can be improved. Why stop halfway when you can make something even better?? Maxwell said. ?The focus on problem solving naturally makes us competitive because we are making pavement maintenance products our customers need and want. ?